Yavneh is a "synagogue-without-walls". We meet for worship at Beth Meyer Synagogue (504 Newton Rd, Raleigh) and St. Mark's Episcopal Church (1725 North New Hope Road, Raleigh). Check the online calendar to find out when our next service is, as well as other Yavneh events. 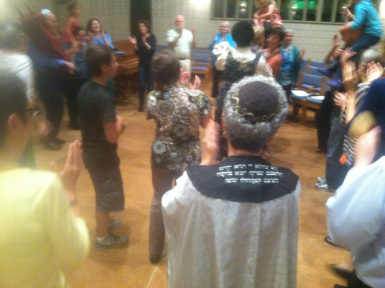 Yavneh, and Jewish Renewal in general, takes a "lab class" approach to worship. While it respects the structure of traditional Jewish services, Renewal also explores the power of varied musical forms; interpretive translations; chant; meditation; simultaneous Hebrew and English readings; silence; and movement to enhance the power of ancient words and music. Yavneh is a "come as you" are congregation - dress ranges from suit and tie to jeans and t-shirt. When you attend a service, don't be surprised when multiple people greet you and introduce themselves. We are a friendly bunch, and want visitors to feel welcome!